New work at the settlement of Dhaskalio, the site adjoining the prehistoric sanctuary on the Cycladic island of Keros has shown this to be a more imposing and densely occupied series of structures than had previously been realised, and one of the most impressive sites of the Aegean during the Early Bronze Age (3rd millennium BC). Until recently, the island of Keros, located in the Cyclades, south of Naxos, was known for ritual activities dating from 4,500 years ago involving broken marble figurines. 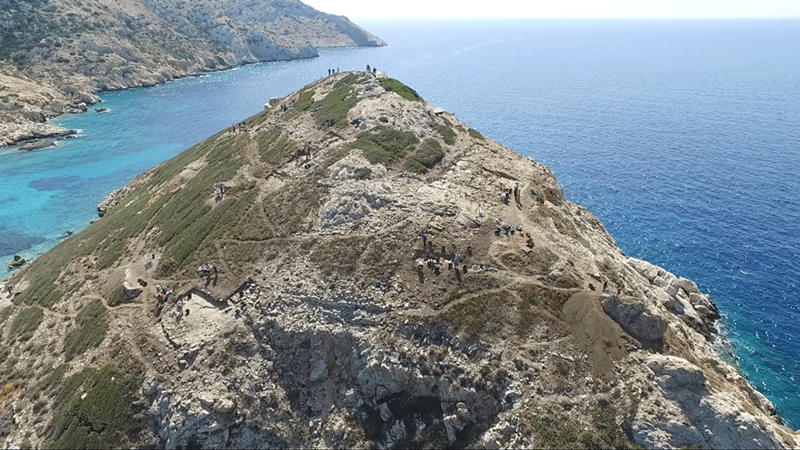 Now new excavations are showing that the promontory of Dhaskalio (now a tiny islet because of sea level rise), at the west end of the island next to the sanctuary, was almost entirely covered by remarkable monumental constructions built using stone brought painstakingly from Naxos, some 10km distant. 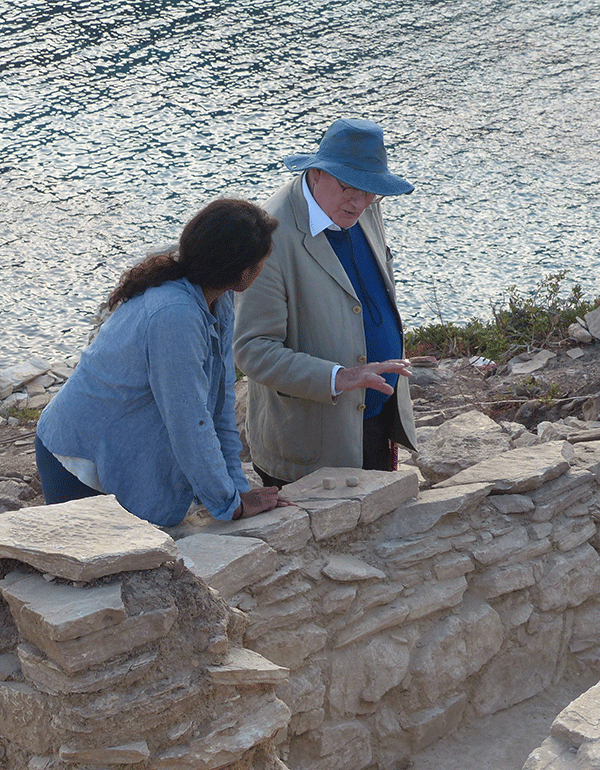 Professor Colin Renfrew of the University of Cambridge, Co-Director of the excavation, suggested that the promontory, with its narrow causeway to the main island, “may have become a focus because it formed the best natural harbour on Keros, and had an excellent view of the north, south and west Aegean”. The promontory was naturally shaped like a pyramid, and the skilled builders of Dhaskalio enhanced this shape by creating a series of massive terrace walls which made it look more like a stepped pyramid. 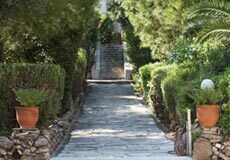 On the flat surfaces formed by the terraces, the builders used stone imported from Naxos to construct impressive, gleaming structures. The research team, led by archaeologists from the University of Cambridge, the Ephorate of the Cyclades and the Cyprus Institute, have calculated that more than 1000 tons of stone were imported, and that almost every possible space on the island was built on, giving the impression of a single large monument jutting out of the sea. The complex is the largest known in the Cyclades at the time. Renfrew noted that “Investigations at multiple points throughout the site have given unique insight into how the architecture was organised and how people moved about the built environment”. 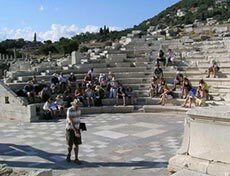 While excavating an impressive staircase in the lower terraces, archaeologists began to see the technical sophistication of this civilisation 1000 years before the famous palaces of the Mycenaeans. Underneath the stairs and within the walls they discovered sophisticated systems of drainage, signalling that the architecture was multipurpose and carefully planned in advance. Tests are now underway to discover whether the drains were for managing clean water or sewage. What was the reason for this massive undertaking here? The excavated soil of the site is being examined in great detail for tiny clues in the form of burnt seeds, phytoliths (plant remnants preserved as silica), burnt wood, and animal and fish bones. Lipid and starch analysis on pottery and grinding stones is giving clues about food production and consumption. Plant remains have been recovered in carbonised form, predominantly pulses and fruits such as grape, olives, figs and almonds, but also cereals such as emmer wheat and barley. Margaritis notes: “Keros was probably not self-sustaining, meaning that much of this food was imported: in the light of this evidence we need to reconsider what we know about existing networks to include food exchange”. Another clue may be found in metalworking, the most important new technology of the third millennium BC. The inhabitants of Dhaskalio were proficient metalworkers, and the evidence for the associated technologies is strong everywhere on the site. 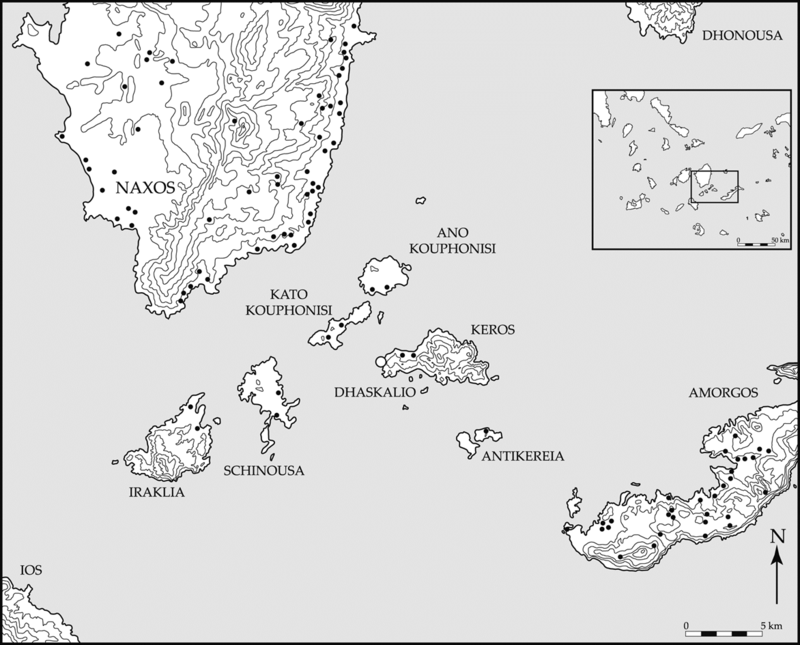 No metal ore sources are located on Keros, so all raw materials were imported from elsewhere (other Cycladic islands such as Seriphos or Kythnos, or the mainland). These imported ores were smelted just to the north of the sanctuary, where the winds were strongest, needed to achieve the very high temperatures required to extract metals from ores. Within the buildings of Dhaskalio, the melting of metals and casting of objects were commonplace. The new excavations have found two metalworking workshops, full of metalworking debris and related objects. In one of these rooms a lead axe was found, with a mould used for making copper daggers, along with dozens of ceramic fragments (such as tuyères, the ceramic end of a bellows, used to force air into the fire to increase its temperature) covered in copper spills. 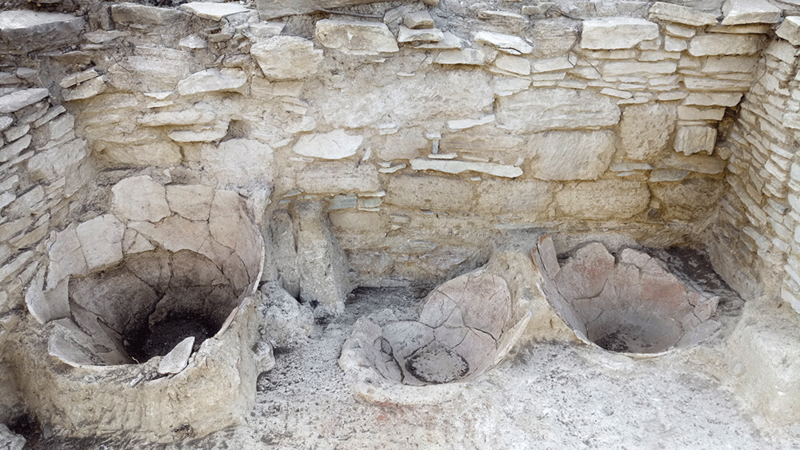 In another room, which only appeared at the end of excavation this year, the top of an intact clay oven was found, indicating another metalworking area, which will be excavated next year. What is the significance of the metalworking finds? Dr Michael Boyd of the University of Cambridge, Co-Director of the excavation, says “at a time when access to raw materials and skills was very limited, metalworking expertise seems to have been very much concentrated at Dhaskalio. What we are seeing here with the metalworking and in other ways is the beginnings of urbanisation: centralisation, meaning the drawing of far-flung communities into networks centred on the site, intensification in craft or agricultural production, aggrandisement in architecture, and the gradual subsuming of the ritual aspects of the sanctuary within the operation of the site. This gives us a clear insight into social change at Dhaskalio, from the earlier days where activities were centred on ritual practices in the sanctuary to the growing power of Dhaskalio itself in its middle years”. 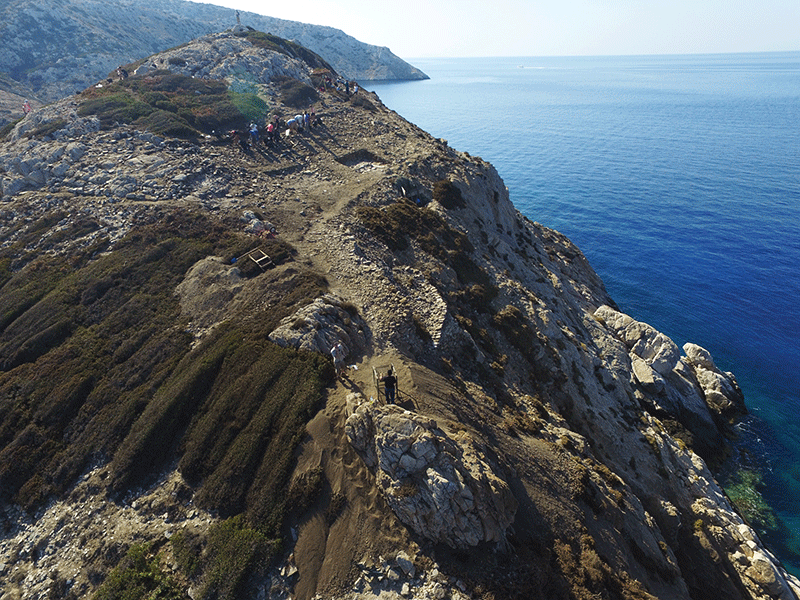 The excavations on Keros are leading the charge of technical innovation in Aegean archaeology. All data are recorded digitally, using a new system called iDig – an app that runs on Apple’s iPads. 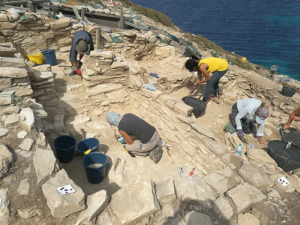 For the first time in the Aegean, not only data from the excavation, but the results of study in the laboratory are all recorded in the same system, meaning that anyone on the excavation has access to all available data in real time. 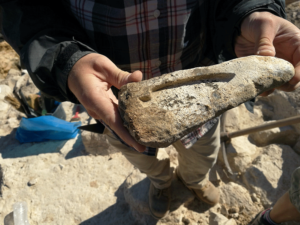 Three dimensional models are created at every stage in the digging process using a technique called photogrammetry; at the end of each season the trenches are recorded in detail by the Cyprus Institute’s laser scanning team. The Cyprus Institute co-organised for a second year an educational programme during this year’s excavations with Cambridge University. Students from Greece, Australia, New Zealand, the USA, Canada, and the UK joined the excavation and gained valuable experience of up to the minute excavation and scientific techniques. The syllabus epitomised the twin goals of promoting science in archaeology and establishing the highest standards of teaching and research. 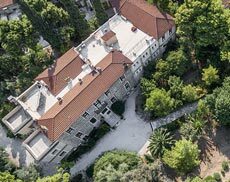 The project is organised under the auspices of the British School at Athens and conducted with permission of the Greek Ministry of Culture and Sport. The project is directed by Colin Renfrew and Michael Boyd of the McDonald Institute for Archaeological Research, University of Cambridge. The project is supported by the Institute for Aegean Prehistory, the Cyprus Institute, the McDonald Institute for Archaeological Research, the British Academy, the Society of Antiquaries of London, the Gerda Henkel Stiftung, National Geographic Society, Cosmote, Blue Star Lines, EZ-dot and private donors.